Beginning today and four the next four days, Freshco Ontario has a great offer on a couple of food staples. From today, February the 7th, until Sunday, February the 10th, you can head to Freshco to pick up Compliments Butter 454g, salted or unsalted, for $2.77. They also have Compliments Bread for just $1 for these four days. 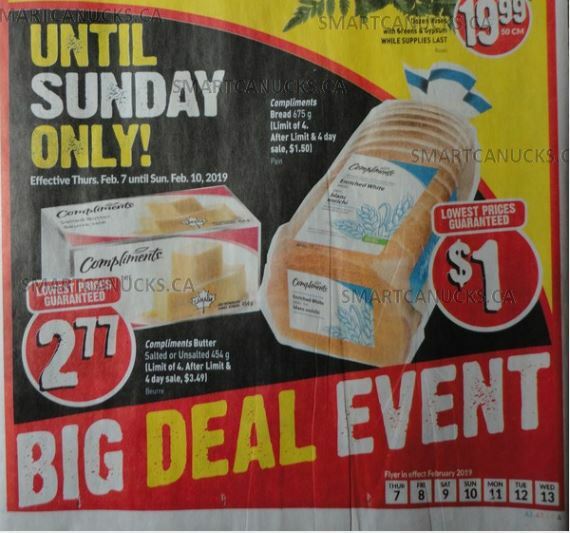 There is a limit of four per person for each of these items, and after the limit and for the rest of the week beyond the four days the price for the butter is $3.49, and the price for the bread is $1.50. While you are there you may want to pick up some of the other great deals this week. like Nestle Parlour treats or Sundae for $1.99, Smartfood for $1.99, or Blackberries for $1.44. Click here to view these offer in the Freshco Ontario flyer.